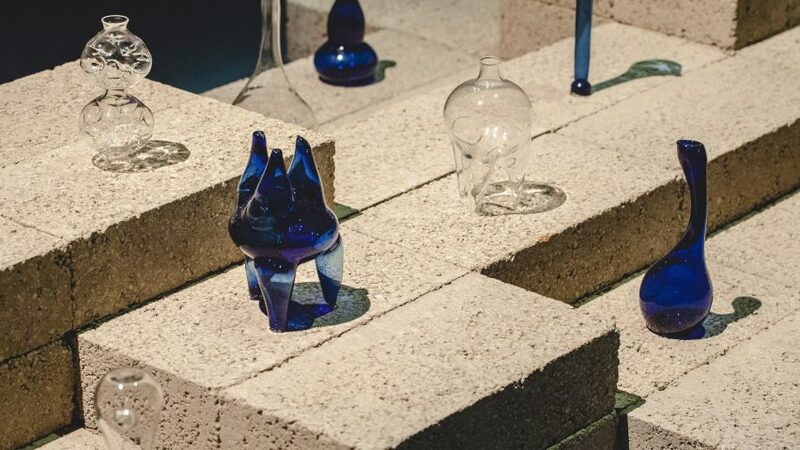 Palestinian architect Dima Srouji worked with traditional glassblowers from the small West Bank village of Jaba' to create this series of unusual vessels, which were on show at Amman Design Week. Srouji was concerned the ancient craft was dying due to the region's isolation, so she devised the Hollow Forms project to introduce the glassblowers to contemporary design approaches. The craftsmen worked from her 3D renderings, creating abstract vessels inspired by the Palestinian land. "The glass blowing industry in Palestine is one of the most beautiful and technically advanced local traditions," said Srouji. "The tradition has managed to survive for the last seven centuries; however, due to the fragility of the political context and the fragility of the material itself, the exportation of the products has decreased dramatically in recent years." "To revive this tradition the concept of this project is to experiment with more contemporary forms and collaborate with the craftsmen in the area to produce a provocative exhibition. The goal is to highlight the cultural heritage while maintaining the current global standard of product design." While Srouji was teaching craftsmen Ali and Marwan Twam contemporary design, they imparted their glassblowing techniques on her in exchange. They use a particular method called lampworking, which uses a burner torch to soften and sculpt the glass. The exposure to the process gave Srouji the opportunity to discover its quirks and allowed her to adapt her designs in collaboration with the glassblowers. "As I started learning how the process works myself and spent more time hands on, I realised that the fluidity of the material can generate forms that are more aesthetically powerful because of the factor of human intuition," Srouji told Dezeen. "For example, one of the pieces has a really long blue neck. The proportions are all identical to the 3D form on the computer, but as we started creating the piece, I realised that it's more beautiful with the long elegant neck. Allowing ourselves to get lost in the translation is actually where the creativity and collaboration are really at their peak in the process." While the finished forms have an animalistic appearance, they are actually driven by Srouji's architectural studies at Yale University, where she studied under Peter Eisenman and Greg Lynn. "Like Piranesi's Campo Marzio, which Tafuri calls 'the absolute disintegration of formal order', this experiment looks at what the relationship of these figures are to each other and they can create a heterogeneous field," said Srouji. "I'm poking a little bit at formalism by using inspiration from the Palestinian land, the history of the craft, and the people I'm working with. I try to evoke the spirit of the place while giving the forms some agency. Piranesi produced a virtual Rome outside of its real time and space, and with this inspiration, I visualise Palestine as a series of strange hollow forms — a kind of fantasy." After living and practicing in London, New Haven and Milan, Srouji is now based in Ramallah. She works for the Riwaq Centre for Architectural Conversation to renovate Palestinian villages — which is what brought her to Jaba' and to the door of glassblowers Marwan and Ali, for whom she is renovating a new workshop. The Hollow Forms project was on show at The Hanger, the main exhibition space for Amman Design Week, which ran from 6 to 14 October. Emerging Jordanian designers made a strong showing in the exhibition, alongside works by designers from across the region.